KFC and its agency, Sid Lee Paris, are bringing the American chain's iconic spokesperson, Colonel Sanders, to France for the first time. The fried chicken chain opened its first restaurant in the country back in 1991 but, 27 years later, only 3% of French people can identify Sanders, who has regularly appeared on the chain's in-store buckets over the years. 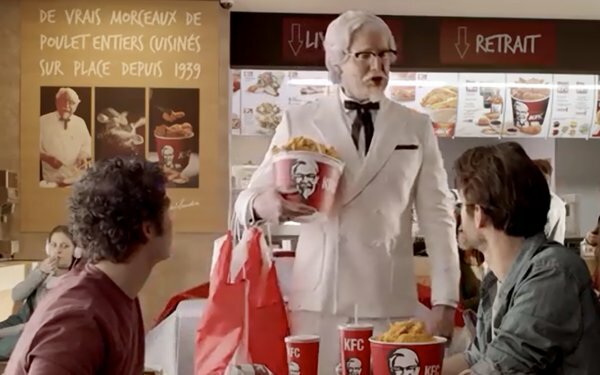 "Our hope is to make Colonel Sanders a real pop culture personality in France. It’s an incredible opportunity to be able to tell the story of such a persona," stated Céline and Clément Mornet-Landa, creative directors, Sid Lee Paris. The iconic figure was first introduced via a 90-second film that follows the Colonel who, after overhearing two young Frenchmen chatting indifferently about his chicken, embarks on a journey from Kentucky to the Gallic country. The clip finds him explaining common American knowledge, such as his secret blend of 11 herbs and spices. Sid Lee Paris decided against adjusting the spokesperson for local tastes. For instance, Sanders keeps his strong American accent. The brand platform also includes an outdoor campaign that announces his arrival to the country as well as a Twitter Uptime activation that posted a tweet every minute for the hour leading up to the film’s launch during prime-time TV on Sunday, Jan. 14. Additional executions will continue throughout the year.